Before you begin your housing search, try to get a mortgage preapproval, which is usually good for up to 90 days. After reviewing and verifying some of your financial information, lenders will tell you how much money they’d be willing to let you borrow. Getting preapproved can speed up the sale process and demonstrates to sellers that you’re serious about buying. Here’s a closer look at how you could benefit from a mortgage preapproval and what it takes to get one. On a very basic level, buying a home is like deciding where to go for dinner. Although the possibilities may seem endless, you’ll need to stick to your budget. Ask yourself, how much house can I afford? And stay within that range. Otherwise, you may end up regretting your decision. A mortgage preapproval ensures that you can focus on looking at homes that you can afford, since a lender provides you with a letter saying how much money you could get from it for a mortgage. To obtain a preapproval, you’ll need to provide your would-be lender with some financial documentation, including a copy of your credit report, tax returns, pay stubs and checking and savings account statements. This helps financial institutions determine your creditworthiness. Usually it’s free, but you may have to pay the lender’s cost to get your credit report. Getting a mortgage preapproval isn’t a 100% guarantee that you’ll receive a loan. However, as long as there aren’t any dramatic changes in your personal finances, it’s fairly safe to assume that the lender will let you borrow the stated amount. Therefore, it’s best not to switch jobs just before applying for a mortgage and to avoid racking up additional debt between getting preapproved and actually trying to borrow the money. When looking at homes, a preapproval letter can be a great tool with which to impress sellers. This document indicates that you’re serious about buying. More importantly, it shows you’d probably get the needed financing and that you have the backing of a lender to go through with a deal. Having that kind of support could even give you additional leverage when negotiating the final price of a home. 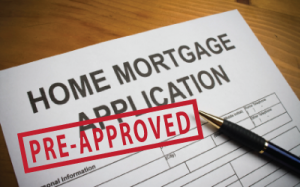 Although they sound quite similar, a mortgage pre-qualification is not the same thing as a preapproval letter. The former is simply when a lender provides a potential homebuyer with a rough estimate of how large of a loan he or she might be able to take out. This is based on very little background information, and so pre-qualification letters don’t carry much weight if presented to a seller. Before applying for a preapproval, work on improving your credit score. Reduce your debt as much as possible while making sure not to accumulate any more of it. These moves will make you look like a better risk to lenders. Once you have a preapproval letter in hand, you’ll be that much closer to buying your own home, even if you haven’t won the lottery.